Curses and spells have power to impose invisible barriers in someone’s life; such that the person works so hard but gets so little results. They can also affect someone’s health, business and relationship in a very negative way. 1. The real meaning of a curse and a spell. 2. What the Bible says about curses and spells. 3. The 6 types of curse Curses and spells have power to impose invisible barriers in someone’s life; such that the person works so hard but gets so little results. They can also affect someone’s health, business and relationship in a very negative way. 3. The 6 types of curses and spells. 4. Signs of a curse in operation. 6. How to remain free from curses and spells. Prayers that break curses and spells. Prayers that release God's blessings and favors. • Break all curses that have been made over your life, curses that are now limiting the flow and manifestation of God’s blessings in your life. 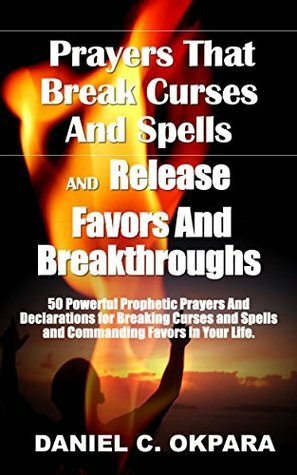 • Reverse all spells that have been cast on your life, spells that are working so hard spiritually to destroy you by making you act in ways that are not right. • Destroy all kinds of invisible barriers that pose a limitation in your life pursuit. • Command the blessing and favors of God into your life, family and business. To ask other readers questions about Prayers That Break Curses and Spells, and Release Favors and Breakthroughs, please sign up. Found this book very helpful and the prayers are very practical, powerful, appropriate and effective for every type of situation that we face spiritually in our lives. And it taken advantage of will do exactly what it says that it will do. I expect to use and to recommend this book to my congregation. I was thankful for so many different facts about prayer and breaking curses. I am confident that I have received deliverance from those things that I know were holding me back. In Jesus name I proclaim that I am free from that which bound me. It was ok. Overall, however, I was disappointed. Very insightful and inspiring. Helps you understand some things and view things from a different perspective. Would definitely recommend it! An amazing and knowledgeable read. Great for teaching the ways of prayer, Faith and knowledge of the bible. Many helpful scriptures. It’s a great book for those who need help through a stalemate in their life. It is a useful read. I love this book and it has opened my eyes. Thank God for this book. Powerful! Practice this book ! This book is a must for everyone who has been suffering any bondages, curses or spells you really need to invest into year Destiny. It's your time to be Blessing Delivered & Set Free.